If I were to compile a list of my Favorite All-Time Underrated Movie Classics Of All Time (Of All Time! ), Peter Jackson's sick little 1996 outing, The Frighteners, would most definitely be near the top of the list. It's one of those movies that still has a core of die-hard fans, but sadly it seems to have slipped out of the memory of most moviegoers. That's not too surprising, since The Frighteners suffered from a horribly inaccurate marketing campaign and did miserably at the box office back in the day. Hopefully it will find an all new audience this fall, because Universal has announced a 15th anniversary Blu-ray edition due out September 13th. For the many of you who likely have no idea what the hell I'm talking about, back before he was conquering Middle Earth, director Peter Jackson directed and co-wrote (with Fran Walsh) a delightfully dark horror comedy called The Frighteners. Michael J. Fox stars as an embittered architect who develops the ability to see and communicate with ghosts after his wife is killed in a car wreck. Rather than dedicating his new powers to fighting crime, Frank [Fox] befriends several ghosts and then enlists them to haunt local houses so he can charge people to come in and "exorcise" their home. His scam is sidelined, however, when he witnesses a mysterious figure that looks like the Grim Reaper marking and then murdering people. Part of the reason The Frighteners made such an impression on me is because it caught me -- and probably the other 12 people who saw it in theaters -- completely off guard. The trailers made it look like a light-hearted tread through Ghostbusters territory. And that tone is there, sure. But what I wasn't prepared for was just how dark, how disturbing, how...well...frightening The Frighteners would prove to be. This movie is the reason why, 15 years later, the mere sight of Jake Busey sends an involuntary shiver down my spine. In a lot of ways, The Frighteners was a movie well ahead of its time. It also makes a helluva double feature with The 'burbs. 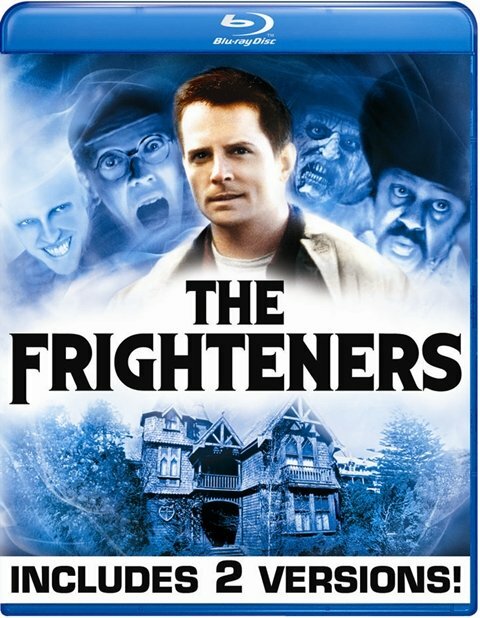 The Frighteners previously got a high-def release on the short-lived HD-DVD format, but I can't wait to see what it looks like all polished and spit-shined on Blu-ray. Universal's not listing much by way of extras, just storyboards, a making-of featurette, and pocket Blu support, but this is a movie that's worth the purchase even if it was bare bones. It will, however, include both the theatrical and a director's cut. If you've never seen it, watch it in the dark. I dare you.